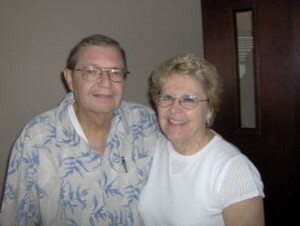 Randy and Betty Poyner, both now with the Lord. Longtime Grace Brethren pastor, counselor, and musician Randy Poyner has gone to be with the Lord. Here is an edited version of an e-mail message from his son, Timothy. I wanted to let you dear friends of my parents know that my dad passed away at 3:05am this morning. He never regained enough strength after his surgery last month and when he was not able to fully participate in rehab we moved him into a hospice facility in Port Orange FL early last week. I received a call Sunday morning from a friend here in Palm Coast that was with my dad that morning letting us know that dad had taken a turn for the worse and was exhibiting signs that various systems were beginning to shut down. My sister, Susan, and I were both at his bedside through the night. We spoke of memories, played music, held dad’s hands and whispered peace to him. He rested most of the time due to some medication that the hospice nurse gave him to help him relax. Around 2 a.m. his eyes were more open and, while he wasn’t able to say anything verbally, we knew that he was aware of our presence. I had just started playing his “Randy” recording. At 3 a.m. Susan left the room for just a minute and was talking to the hospice nurse right outside the room. I moved over to the position where she was sitting on the edge of dad’s bed (he was turned a bit more in that direction) and as I held his face in my hands, told him I loved him and whispered that he was free to go, he made his final emotional gasp and he was gone. While we grieve at his absence we will feel on this earth, we rejoice knowing that his long battle and his aloneness is done. His body, mind, and soul are finally and fully healed, he is in the presence of his heavenly father, his brother Jesus and his comforter, the Spirit of peace—and he once again is with my mom, the love of his life that he deeply mourned over the past few years. Because he will be cremated there is no urgency for a funeral service. We plan to have a memorial service here in Palm Coast within the next few weeks and a memorial service in Waterloo, Iowa, before the end of the summer. We are still trying to coordinate and finalize dates for these services. Thank you for your friendship with my parents and especially my dad over the past few years. Our deepest sympathy to you guys. Not sure you remember us from the Ft.Myers days, but your parents were very influential to us in our "baby" Christian days. We grieve not as the world, because of our 'hope' in the certainty of eternal life. I think I'll have to pull Randy's record album off the shelf, find a turntable somewhere and listen to it. I played bass on the recording and one night in the studio when we had just finished recording "He giveth more Grace," I got a phone call that my grandmother had passed away. I'm confident that the grace that was sufficient for me on that night will sustain you through these times. Susan , Tim ,Mark , your Fam.and Loved ones , our deepfelt condolence to you all at this time of sorrow. But we sure thank and praise our dear Lord , that He saw fit at this time to take your Dad home to glory. Our thoughts and Prayers and our Love is with you . Along with you we lost very dear friends in Betty and Randy. Randy was one of the best friends a fellow pastor could ever have. He loved the Lord, his family, the family of God, and his fellow-man. What more does the Lord require? Susan, Tim, Mark and Families, Thanks for sharing a hard but encouraging time of your Dads home going. Home Free to say the least. Your Dad and Mom were very close to my folks and our family. I remember your Dad one Sunday at our house when I was about 10 years old and he gave me a ride on the old corn picker and tractor. It's funny the things we remember. I still get out the old recordings of your folks singing and listen to them. What great folks you kids had. We will be praying for your families at this time and hope to extend our sympathy when you are in Waterloo. My prayers and thoughts are with you Tim, Sue and Mark. I am so honored and blessed to have known your family... You and your families are continually thought of . We grieve the loss of our dear friend and rejoice at the victory that is now his in Christ Jesus. Randy and Betty were friends, mentors, supporters and prayer warriors for many years. We wish to express our sympathies to the family. We grieve your/our loss but are absolutely thrilled at Randy's gain. To be absent from the body is to be present with the Lord, with Betty and with many other precious brothers and sisters who have preceded him in passing from this mortality to life indeed. Hallelujah.